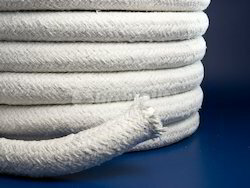 Offering you a complete choice of products which include ceramic rope. Ceramic Rope includes twisted rope, round braided rope and square braided rope. Ceramic Rope are made from our high quality ceramic fiber material. They can be used for high temperature applications up to 1060°C. Application:High temperature pipe insulation and sealing, cable insulation coating, coke oven opening sealing, pyrolyzer brick wall expansion joints, electric stove and bake oven’s door sealing, boiler, high temperature gas seals, flexible expansion joint connection.